Today I am going to start a new Giveaway for my readers . 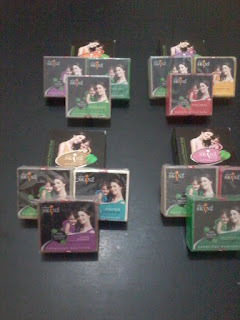 Its Giveaway of Sheer Skinz Herbal soaps. All its products are pure and natural. I have used several products from its range like Soaps , Body wash , Face wash , all are good . I have already reviewed a Sheer Skinz soap , one can read the review Here. I would like to thank Mr . S SAHNI the MD of Omega Remedies for his kind cooperation to sponsor this giveaway so that my readers can try these herbal soaps . There is four Gift hamper each containing four soaps . So there will be four winners in this giveaway . Each winner will get one hamper containing four herbal soaps from Sheer Skinz . 3.Be active on my blog and try to leave a comment on the posts you like , one can leave comments on older posts as well . Winners will be declared on this blog ( in the giveaway post ) and face book page of Indian Beauty Bloom. Thanks every one for participating in this giveaway . After checking all entries I have chosen 4 winners on the basis of their active participation . Send your details to me at ghazli10saba@gmail.com or one can also send a direct message to FB page of IBB. Please include complete postal address along with PIN and mobile number .